This is the 'Rabia sign.' 'Rabia' means four or fourth in the Arabic language. The name of this square comes from Rabia al-Adawiya, a blessed lady among the pious servants of Allah. She received the name Rabia because she was the fourth child in the family. We use the sign to cherish her legacy. The second reason why this sign bears significance is the fact that Mohamed Morsi was the fourth President of Egypt after Gamal Abdel Nasser, Anwar Sadat and Hosni Mubarak. We make the sign to remind people of his presidency. In addition, those who gather in Tahrir Square to support the military coup prefer the V sign made with the two fingers. We cannot be the same as those people. We use and spread the Rabia sign in order to distinguish ourselves from them. According to the R4BIA website, the protestors who provided the explanation for the symbol were killed with hundreds of other Muslim Brotherhood supporters who had camped out in the tent city for weeks. The violent incident and the symbol that has come to represent it have been endowed with supernatural qualities. The number four has acquired mystical connotations signified by the name of the square, the succession of Egyptian presidents and the birth order of Rabia al-Adawiya. The slain supporters have been bestowed with heroic status and the Islamist honor of martyrdom and are now referred to as the "Rabia Martyrs." A new Islamist legend was born out of the blood of Egyptian protesters. It would not be surprising if pilgrimages to Rabia al-Adawiya Mosque to commemorate the new martyrs occur each year on the anniversary of the violence. The symbol is quickly evolving into a full-fledged R4BIA movement. A mythology surrounding the R4BIA martyrs is emerging. One of the new myths is that the blessings of the new martyrs are responsible for spreading the symbol beyond Egypt's national borders to become the symbol of awakening to the global Muslim community. Although the new blessed martyrs are getting credit for spreading the message, they are receiving a lot of help from the Muslim Brotherhood propaganda machine and Turkish Islamists. A Turkish website R4BIA.com has been launched in three languages, Arabic, English and Turkish, explaining the origin of the symbol and promoting a R4BIA movement. 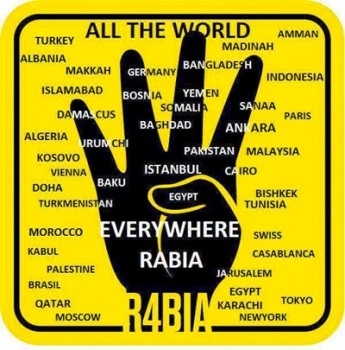 R4BIA.com contains photos and videos of protesters and includes a R4BIA song whose lyrics are comprised of the writings of Sayyid Qutb, an influential leader of the Muslim Brotherhood and the father of violent Islamism. The site also contains a video showing family photos and the letter written by senior Muslim Brotherhood leader Mohamed Beltagy to his 17-year-old daughter Asma, who was shot and killed during the protests. The letter will become a classic in Muslim Brotherhood propaganda, as it includes a heart rending eulogy filled with the symbolism of female martyrs as brides of paradise when her father describes her death in a dream as a wedding. Many activists on social media have confirmed that the sign originated in Turkey, which officially opposed the military coup in Egypt. Turkish Prime Minister Erdogan was one of the first to promote the R4BIA hand sign during a speech on August 17 when he saluted crowds several times with the four-finger sign. Turkish footballers also began to use the hand sign after scoring goals, soon after the symbol became popular on Turkish social media. It used to take years, sometimes decades, for a symbol to achieve global recognition, however, in the age of technology, with Instagram, Facebook, YouTube, Twitter and the Internet, this new Islamist sign went viral in days. Although the R4BIA symbol may have originally signified solidarity with massacred protesters, the meaning and the imagery has rapidly been radicalized to embody the primary concepts of Islamist propaganda: honor, heroism and martyrdom in the goal of establishing an Islamic caliphate. Images of the R4BIA symbol now include the fingers being depicted as rifles, the hand holding the black flag of jihad and writing on the hand calling for an Islamic Caliphate. Perhaps many of those holding placards, wearing t-shirts and raising the four-finger salute do not understand the radical implications. Similar to movie stars and students who wear keffiyeh scarves, they may just assume it's a cool, hip solidarity thing to do. However, there is no doubt that the Muslim Brotherhood understands the significance of disguising their true Islamist agenda, which is why they rebranded their name to the Freedom and Justice Party and removed images of the Quran and crossed swords from their logo. The R4BIA sign is not a benign peace symbol; it is a symbol of resistance, Islamism, martyrdom, and a visual call to arms comparable to the black flag of jihad. The black hand on the bright yellow background is appropriately similar to highway warning signs that caution us against danger and indicate a hazard ahead on the road that may not be readily apparent.